Looking for a tempting weekday lunch to make for yourself or someone special? 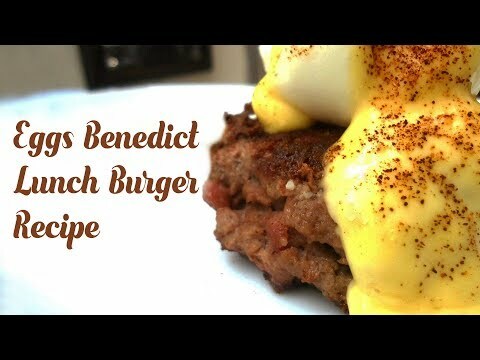 For a big hit lunch recipe “Eggs Benedict Burger” could be an instant pick. The weekday overload really needs some satisfying food to balance your mood, this recipe will satisfy your soul and make you crave for it every day. This can be on your fancy burger list as you have ground beef, eggs, sliced avocado, and paprika together in a burger. Just invest your 25 minutes to make this lavishing mouth watery dish that can be your biggest win. Nothing’s better than a combination of saucy, tasty and biggest burger for lunch. A perfect Benedict eggs with beefy patty literally a melt in your mouth, have one bite and you would want it regularly. In a bowl, mix the ground beef with 2 eggs. Chop the garlic and the parsley. Add to the previous mixture and mix. Season with sea salt. Make four patties of the size of a muffin and cook them for 5 minutes on each side. Poach the 4 remaining eggs in a sauce pan with 2 cups of water and 1 tbsp. of apple cider vinegar. Do it one by one. Serve one poached egg over one patty. Accompany with sliced avocado. Sprinkle paprika over the egg. You can substitute parsley with cilantro. It’s easy to make, simple to prepare and a great substitute for your regular lunch routine. We Being Fit couldn’t stop sharing this whole big appetite with you. The incredible lunch recipe is sure to satisfy your food cravings and keep you fueled up for a long time. Enjoy this delicacy with your family or friends and make your favorite toppings add up in the dish.